Minute one: Bring to mind a current money issue and intensify this issue with a strong visualization. Minute two: With the issue feeling very alive, notice the area of your body that is most energized. Where is the energy located and what are the sensations, thoughts and feelings? Minute three: Focus on that part of your body. Let go of all thoughts and bring breath to this area of your body. Minute four: Concentrate your attention on these sensations and breath. Notice any changes. Minute five: Feel the ease and expansion in this physical area. 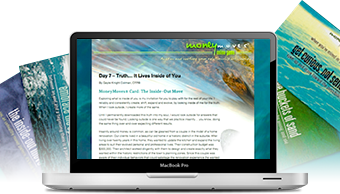 Complete your practice by reflecting on your money mess. What insights arise? What is this “Money Mess” teaching you? Are you willing to follow the opening?